The Best Happiness blogs from thousands of top Happiness blogs in our index using search and social metrics. Data will be refreshed once a week. Also check out Happiness Youtube Channels. 2.14 Tiny Buddha - Simple wisdom for complex lives. 2.19 Brain Pickings – An inventory of the meaningful life. 2.23 Conscious Lifestyle Magazine | The Mind Body Spirit Magazine, Evolved. Happiness newsletter is a comprehensive summary of the day's most important blog posts and news articles from the best Happiness websites on the web, and delivered to your email inbox each morning. To subscribe, simply provide us with your email address. About Blog The Greater Good Science Center studies the psychology, sociology, and neuroscience of well-being, and teaches skills that foster a thriving, resilient, and compassionate society. Facebook fans 102,773. Twitter followers 39,370. New York City About Blog My experiments in the pursuit of happiness and good habits. Facebook fans 253,374. Twitter followers 137,355. Amsterdam, The Netherlands About Blog For those who want to escape from the hectic and delusion of the day and therefore seek harmony and meaning in their lives. Happinez inspires with quotes, photography, interviews and reports about spirituality, wisdom, health, travel and culture. Facebook fans 190,387. Twitter followers 26,855. Sweden About Blog It’s a resource on how to live a happier life, increase your self-esteem and confidence, become more productive, simplify, and improve relationships and social skills. Facebook fans 40,991. Twitter followers 8,871. Scotland, UK About Blog Change Your Thoughts was created by Steven Aitchison to help millions of people around the world to better themselves in any way they can. A collection of hundreds of personal development articles from psychology, health, relationships, lifestyle, spirituality and business. A must read blog. Facebook fans 3,757,031. Twitter followers 10,880. Sydney, Australia About Blog Leading expert in happiness & positive psychology. What can happiness do for you? According to this blog, just about anything. Read about what happiness can fix and get smiling! Facebook fans 1,611. Twitter followers 27,850. Brooklyn, NY About Blog This is a great blog for everyone who accepts that our happiness and performance is directly linked to our daily habits. Topics range from nutrition, exercise and happiness to meditation and relationships. Facebook fans 3,242,719. Twitter followers 304,081. South Florida About Blog Practical Tips for Productive Living, self improvement, tips for life and personal development. A popular personal development blog featuring original weekly articles on productivity, lifehacks, inspiration, positive living, social skills, tech tricks, wealth, health and happiness. Facebook fans 273,228. Twitter followers 57,928. About Blog Blog by Jack Kornfield. Author, Buddhist Practitioner and one of the key teachers to introduce Buddhist mindfulness practice to the West. As the Buddha teaches…A Generous Heart Is The Source of Happiness. It tears down walls. It connects you to others. May the blessings of all your generosity spread goodness to you and all beings. Facebook fans 99,869. Twitter followers 119,667. About Blog The number one goal of The Color Run is to produce 'The Happiest 5k on the Planet’ giving participants an unforgettable experience. With no winners or official times, The Color Run celebrates healthiness, happiness, and individuality, helping participants achieve their fitness goals by providing a fun, un-intimidating running environment. Facebook fans 5,752,783. Twitter followers 125,855. 14. Tiny Buddha - Simple wisdom for complex lives. San Francisco, CA About Blog The world is full of a lot of fear, negativity, and a lot of judgment. We think people could use a place for joy and happiness. Welcome to Happiness. Facebook fans 1,176,754. Twitter followers 535,801. New York, NY About Blog TED is a global nonprofit dedicated to ideas worth spreading. Our goal is to make great ideas accessible and spark conversation. Facebook fans 10,823,520. Twitter followers 10,931,079. New York, NY About Blog View the latest from the world of psychology: from behavioral research to practical guidance on relationships, mental health and addiction. Find help from our directory of therapists, psychologists and counselors. Facebook fans 7,591,995. Twitter followers 545,877. About Blog Lifehack is the leading source of practical and adaptable knowledge dedicated to improving Health, Happiness, Productivity, Relationships, and more.Everything on Lifehack aims to get readers refreshing ideas to end the bad thoughts and bad habits. Get refreshing ideas to end negativity, get things done fast, and achieve bigger goals. Facebook fans 1,257,610. Twitter followers 111,194. 19. Brain Pickings – An inventory of the meaningful life. About Blog Brain Pickings is a record of Maria Popova's own becoming as a person — intellectually, creatively, spiritually — and an inquiry into how to live and what it means to lead a good life. An inventory of cross-disciplinary interestingness, spanning art, science, design, history, philosophy, and more. Facebook fans 4,989,654. Twitter followers 184,282. About Blog Be your best self, Live your best life. Personal Excellence is the no.1 personal development blog to achieve your highest potential in life, free articles, podcasts, and videos to live your best life! Facebook fans 293. Twitter followers 57. About Blog Dumb Little Man is a popular online magazine offering practical life tips and life hacks for happiness and prosperity. Facebook fans 45,207. Twitter followers 11,931. 23. Conscious Lifestyle Magazine | The Mind Body Spirit Magazine, Evolved. Vancouver. LA. Airplanes About Blog Clarity for Keeping it Real on Your Spiritual Path from One Seeker to Another. Love belly laughs. Gold. Compassion. Fires. it's all here. Facebook fans 204,113. Twitter followers 140,840. About Blog Aha!NOW is you daily source of inspiration and solutions to help you improve your life and work. It's niches range from personal development to blogging. Facebook fans 1,692. Twitter followers 254. Copenhagen, Denmark About Blog Alexander Kjerulf is an expert on happiness at work, who speaks and consults around the world. He posts funny and inspirational words and videos. Facebook fans 2,301. Twitter followers 8,298. About Blog Being "positively present" means living in the moment while focusing on the positive in every situation, and that's exactly what Positively Present strives to help you do. Inspiring others to make the most of every moment. Facebook fans 9,036. Twitter followers 8,243. New Zealand About Blog Practical inspiration for a happier life and self improvement. Get a new take on life, find creative ways to make your wildest dreams come true, and become what you aspire to be. Facebook fans n/a. Twitter followers 36,847. Memphis, TN About Blog Colin Wright: Author, Entrepreneur, Full-Time Traveler. I’m an author and international speaker. I host a podcast called Let’s Know Things (for which there is a Patreon) and co-founded a publishing company called Asymmetrical Press. Facebook fans 2,816. Twitter followers 24,414. About Blog To live a life 'all in" follow Shayne Traviss, a student of life as he dives in deep sharing his life experiences, travels and inspirations for living a VividLife. Facebook fans 43,576. Twitter followers 19,225. Singapore About Blog To inspire and coach you in self-love, confidence and belief. To offer you... - inspirational self-love quotes - inspirational short stories, tips and abundance quotes - EFT tapping scripts - positive affirmations - money breakthrough & business success. Facebook fans 22,422. Twitter followers 3,489. About Blog How to be Happy at Work & How to Motivate Employees. Happy Melly is a business that improves the lives of knowledge workers through inspiring books, courseware, conferences, podcasts, workshops, games, and apps. Facebook fans 1,133. Twitter followers 8,450. About Blog Science-backed inspiring news and tips to benefit your life, inspire others, and contribute to uplifting society. Facebook fans 13,039. Twitter followers 29,032. About Blog Hi, I’m Charanjit Kahlon (CK) a corporate professional and an avid lifestyle blogger in the US. I believe it is important to enjoy life and cherish every moment because life is too short. Los Angeles, CA About Blog Life, Liberty, and the Pursuit of Happiness are Not Size Dependent. Facebook fans n/a. Twitter followers 5,792. About Blog Tami is here to help you find inspiration for personal growth and a happy life. Take a look around, maybe you'll like it here! The Inspiration Lady is a self-improvement and lifestyle blog dedicated to helping women live healthy, happy lives. Facebook fans 2,254. Twitter followers 3,469. Hong Kong About Blog Miles of Happiness: the ultimate guide to travel as a lifestyle. Adventures, inspiration, travel tips, illustrations and travelogues from a serial expat. Facebook fans 1,924. Twitter followers 722. Bay Area, CA About Blog Tools, life coaching, award-winning blog & books. The art & science of living a meaningful life. As seen on Oprah, reviewed by NY Times, Deepak Chopra. Facebook fans 16,708. Twitter followers 7,334. India About Blog Your first step towards a happy & positive life, that's the welcoming message from Zeenat on her blog Positive Provocations. She is a firm believer that love, care and positivity can help you to achieve almost everything. Facebook fans 31,346. Twitter followers 3,867. Tampa About Blog Your Happiness blog features tips to finding your happiness through my personal struggle. About Blog We help people discover and leverage their passions superpowers so they can be happier and more productive in their business/career. Delhi, India About Blog Happiness Science for everyone. Curated articles on Happiness, Mindfulness, Wellbeing, Psychology, Psychiatry, and Neuroscience. We aspire to promote higher levels of happiness in the society. Mission to inspire and promote higher levels of happiness in the society. Facebook fans 2,622. Twitter followers 2,607. About Blog Positivity Blogs by Emm. Not meant to apply to everyone, or be detailed discussions of serious topics. Facebook fans 37,569. Twitter followers 2,084. London, UK About Blog Happyologist Susanna Halonen uses positive psychology to help you and your team to bring out your passion so you become your happiest, best performing you. Facebook fans 2,129. Twitter followers 6,208. About Blog The world would be a better place if more people were doing what they love. Life is more interesting when we open our hearts and minds, we are happier when we discover our passion, and magic happens when we follow our dreams. Do What You Love! Facebook fans 11,386. Twitter followers 6,027. Los Angeles, CA About Blog Our vision is a happier world through thoughtful and emotionally-intelligent communications and gifts. Facebook fans 227. Twitter followers 37. About Blog Having decided to completely overhaul my life in the pursuit of happiness, there were certainly those who wondered “what was she thinking?” Follow this blog to find out and learn how to shine with me. A blog by Jennifer Gresham. Facebook fans 36,717. Twitter followers 3,156. Seattle About Blog Shannon Eileen's inspiration and lifestyle blog on love, music, art, travel, books, food, photos, nature, film, design, retro style…and other things that make her smile. Facebook fans 4,705. Twitter followers 1,051. About Blog Life & Style Blog (design, entertaining and fashion all the special moments in between). Facebook fans 2,395. Twitter followers 367. Chicago, IL About Blog By fostering intensive collaboration between philosophers, religious thinkers, and psychologists, we will investigate whether self-transcendence helps to make ordinary cultivation and exercise of virtue a source of deep happiness and meaning in human life. Facebook fans 2,160. Twitter followers 691. About Blog From a ghost writer to iScriblr – my life has been a roller coaster ride of amusing (most of the times), deplorable (sometimes) and impelling (always) moments! An Army brat, gastronome, absurd, an animal love, health freak, married and delightful. This is Richa for you and here, i blog my passion! Welcome to “my world” – where the words are fancy and the heart is honest! Facebook fans 2,810. Twitter followers 283. About Blog I am a creative, a dreamer and an encourager. I have a heart for cooking, home improvement projects, old houses and encouraging people. I am honest and imperfect . About Blog Following a year of posting thoughts on happiness in 2016 as status Facebook status update, I decided to write weekly thoughts on a broader range of topics. I am keen to get your views on the topics and suggestions for future topics. Facebook fans n/a. Twitter followers 3,272. About Blog Your mind is powerful, it can heal you as much as it can harm you. Cochrane, Alberta About Blog A Happiness Blog. Breathing into a blissful balance. Learning how to use the ancient teachings of Ayurveda in every day life. Bringing back balance, focus and bliss. Facebook fans 814. Twitter followers 74. San Francisco, CA About Blog I am here to tell you – if you solve the problem of happiness every other problem will be solved as a result. Sure I can be pithing new modernization plan for the country or how to find cure for cancer and be the most innovative country in the world! Well, I can do that as well. But we need to solve happiness first. London, San Francisco, NYC About Blog My vision is to inspire people to live a purpose and passion driven life and to find happiness from within. Facebook fans 138,518. Twitter followers 2,684. About Blog Interesting prompts ... to start a conversation going ... as and when you might need one ... a diversion to talk about. Boston, MA About Blog To empower people to know that happiness is within their own hands, and to create more happiness in this world! Facebook fans 2,408. Twitter followers 30. Virginia, USA About Blog I’m Joan Senio, a wife, mom, sister, daughter, aunt, godmother, dog-lover, beach-comber, wine enthusiast, blogger, and self diagnosed Positivity Addict! I started this blog in January, 2018 unsure of where it would lead. The blog has almost taken on a life of its own, with amazing people showing up with advice and tips and opportunities surfacing out of the blue. Wales About Blog Small steps to a kinder world. I write about all sorts of green issues from the perspective of what an individual can do. Three years down the line I'm trying to make useful items that have some benefit to the environment... but sometimes I get distracted and what I make is simply quirky! Facebook fans 75. Twitter followers 345. About Blog Let Activated! help you find your path to happiness, success, and fulfillment. We are on a mission to empower you to discover the artist inside of you. Master Your Craft. Elevate Your Skill. Be The Artist! Facebook fans 333. Twitter followers n/a. Sydney, New South Wales About Blog Awesome celebrator of all good things. Happy wife (with a happy life). True believer in George Eliot's words... "It's never too late to be what you might have been." Honolulu, HI About Blog Our mission is to teach that which was not taught in a traditional classroom about how to live a heart-centered life. We commit to inspire, guide and empower all members with information that will bring forth a more positive outlook and lead to a happier experience of life. Facebook fans 2,046. Twitter followers 348. Sacramento, CA About Blog Sharing the hope and encouragement I find along the way on my journey to discovering the Beauty of Who I Am. Facebook fans 217. Twitter followers 122. About Blog We are all about helping women find their happy & spreading the happy around the world through blogs, Happy Hours, & the new Happy Anyway book. Facebook fans 1,755. Twitter followers 81. Camberley United Kingdom About Blog Welcome to Blue Jay of Happiness, a space on the Internet to feel inspired, uplifted and generally a little more cheery. Facebook fans 76. Twitter followers 1,173. About Blog Hey There Happiness – Exploring Ideas That Make Us Happy. We’re a not-for-profit organisation with the sole aim of helping to make you, me and the world happier! Facebook fans 659. Twitter followers 1. Mumbai, India About Blog Exploring the wonders of the wandering mind. About Blog Growing Self is a blog that focuses on Loving Yourself, Embracing Yourself and Just Being You! I write from my heart, with a sprinkle of fairy dust! About Blog I love what i do! I want to inspire! and I want to make a change not in any small way BUT have a huge bloody impact on people to give them the BELIEF that NO MATTER WHAT, the world has a limit but the galaxy’s limitless. About - Change Your Thoughts was created by Steven Aitchison to help millions of people around the world to better themselves in any way they can. A collection of hundreds of personal development articles from psychology, health, relationships, lifestyle, spirituality and business. A must read blog. About - I'm the Chief Happiness Officer of Woohoo inc, international speaker and author of 5 books including the Happy Hour is 9 to 5 and Leading With Happiness. About - Happyologist Susanna Halonen uses positive psychology to help you and your team to bring out your passion so you become your happiest, best performing you. About - Welcome to Blue Jay of Happiness, a space on the Internet to feel inspired, uplifted and generally a little more cheery. CONGRATULATIONS to every blogger that has made this Top Happiness Blogs list! 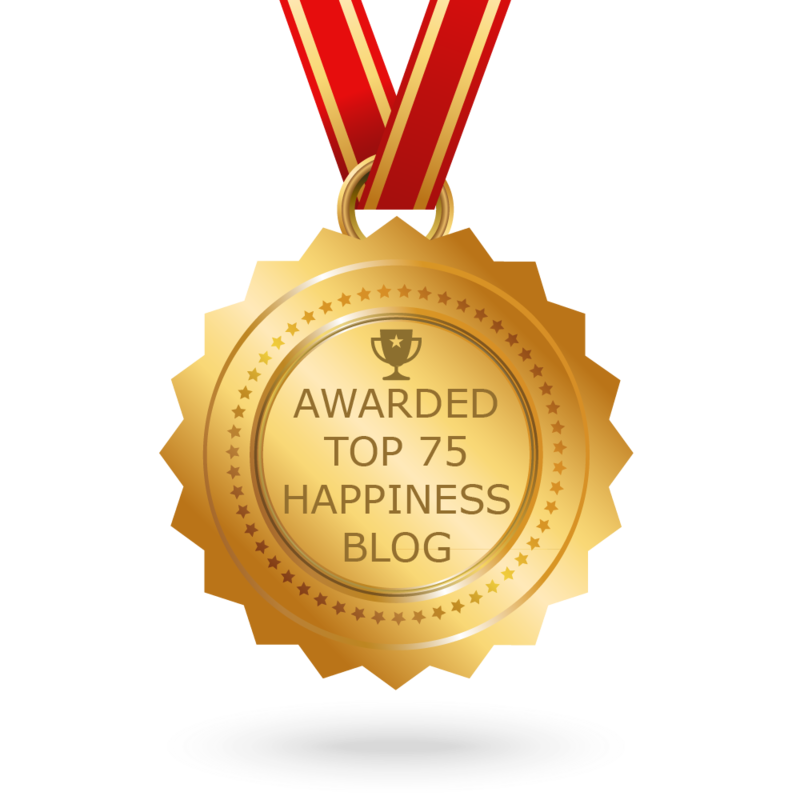 This is the most comprehensive list of best Happiness blogs on the internet and I’m honoured to have you as part of this! I personally give you a high-five and want to thank you for your contribution to this world.